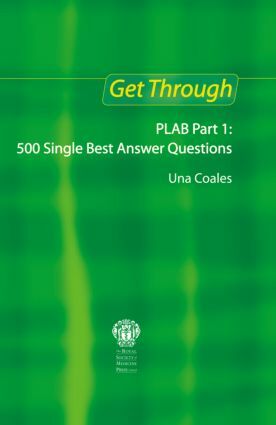 Get Through PLAB Part 1 is an essential revision tool for all candidates preparing for the examination. PLAB Part 1 consists of 70% extended matching questions and 30% single best answer (SBA) questions. As a companion text to the bestselling PLAB: 1000 Extended Matching Questions, this book provides 500 practice SBA questions covering topics that reflect the current PLAB syllabus and presented in a format identical to the exam itself. The author, Una Coales, who has taken and successfully passed the exam herself, offers helpful hints and tips on what to expect and how to negotiate the examination successfully. Get Through PLAB Part 1 is recommended to all candidates sitting the PLAB Part 1 exam, and their trainers.